A gaggle of WWAC writers attended Flame Con this year, some veterans, some new to the event. Here are their highlights from the weekend. 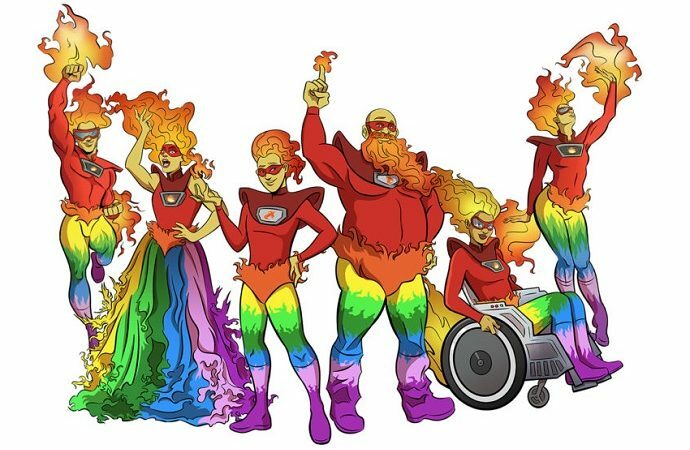 Flame Con has leveled up in its fourth year, moving to a bigger venue in Times Square from Brooklyn. The new digs provided a bigger artist alley and more space for even more queer fans, panels, and stage shows. It’s an all-ages con, and is free for the youth to attend on Sunday, so while things get saucy (and there’s certainly nsfw content to be purchased), it’s a welcoming event to the whole community. It’s comforting, like stepping into an IRL version of checking the “I don’t want to see or be seen by straight people” option on OKCupid. We had a gaggle of writers attend Flame Con this year (some even put together a panel! ), so below you’ll find the diaries of Paige Allen, CP Hoffman, Jamey Hampton, and Kat Overland. Paige S. Allen: 2018 was only my second time going to Flame Con, but I consider it the best comic convention on the East Coast – and I’ve attended about five different cons in the region every year for the past seven years. There is a certain intimacy around Flame Con that trumps all others here, even as the convention itself grows ever larger. Last year, it was held in a medium-sized Marriott in Brooklyn, and this year it moved to the Sheraton in Times Square. The difference in venue was immediately noticeable, as this year’s space now accommodated more vendors on the show floor, more panel spaces, and more room to explore, rest, use the bathroom… important things like that. I will say that the unevenly distributed, bisexual-colored club lighting on the show floor diluted the color in vendors’ artwork and cast shadows over their products. For someone whose eyesight is already incredibly poor, it was a struggle trying to view the products on display. Several vendors with whom I spoke in passing (while sticking my nose right up against their zines, because I couldn’t see them otherwise) also lamented the somewhat poor lighting compared to last year. Also a point of inconvenience was the tabling layout on the show floor, with some makeshift alleyways much larger than others. I’m sure this was done to accommodate vendors who organizers knew would be swamped with lines, but this did cause a lot of slow, single file movement and severe bottlenecking in the smaller alleyways on the floor. Yet through it all, Flame Con remains a successful and enjoyable experience for me because of that aforementioned intimacy — not of space, but more of feeling. I can’t help but feel a certain camaraderie with other attendees and vendors because we’re all congregating in a space that specifically caters to our identities as queer fans, and that feels like a powerful act of communal solidarity and an internal expression of strength. It’s not a happy coincidence that we’re there, but a purposeful commitment to each other and ourselves. It has consistently created a welcoming, exciting environment the likes of which I’ve never experienced at a comic con before, and probably will not experience again outside of this con. It’s such a great time, and I’m already planning my Flame Con trip for next year! CP Hoffman: While I’ve worked a number or comic cons as a journalist, Flame Con was the first where 1) I organized/participated in a panel (“Queer Folks Write About Comics”) and 2) I seriously cosplayed at least one day (in Captain Marvel’s Binary uniform, but with a They/Them sash, so that I was Non-Binary). So, even leaving aside the fact that Flame Con is just incredibly different from other cons, it was already a totally different experience from what I’m used to. Wandering the show floor was fun as always, but I probably got the most out of the panels, which highlighted issues and individuals often ignored at bigger (and straighter) cons. Elana Levin put on a Fan Activism workshop that set out a roadmap for folks wanting to get more involved in pushing media to be better. At the animation panel, Noelle Stevenson described how she made a point of learning what everyone did around the studio, and that knowledge ultimately led to her being able to helm the She-Ra reboot. And, at the Doctor Who fandom panel, the audience got involved in the conversation about just what pronouns we should use for the Doctor now that the Thirteenth Doctor is here. Which isn’t to say the panels were all perfect. There could have been a lot more faces of color up on stage, and one panel I attended opened with the moderator asking everyone’s spirit animal, but with candy. But, by and large, the panels elevated queer voices for a queer audience, and that was something truly special. CP and Jamey at Flame Con lookin' cute, hanging out at tiki bars, and eating brunch – which is the most important meal of the day. Check our twitter to catch their adventures! Jamey Hampton: Flame Con was a convention of firsts for me as well! Not only was it my first time at Flame Con itself, but it was my first time at an out-of-town comicon at all and my first time participating on a panel! Naturally, I was very excited but also very nervous. But of course, I didn’t actually have to be. The welcoming atmosphere was apparent immediately, from the moment I checked in and was offered an array of pronoun stickers. But I’ve been at events where pronoun stickers were available before. The thing that was so different about Flame Con was that not only was nearly everybody actually wearing them, but it felt like almost a majority of people were wearing ones that said “they/them.” For me, it was the first time that I’ve been part of a large crowd where it felt like most of the people there were non-binary like me and it was a pretty magical feeling. I know I wasn’t the only person feeling the magic, either. There was something in the air that just… let people open up to each other, be genuine and maybe even a little sappy. I got to be a little sappy to Shae Beagle, the artist of Moonstruck, the first comic I reviewed when I first started writing about comics, and Molly Ostertag, whose graphic novel The Witch Boy meant a lot to me when I was recovering from my gender affirming surgery. 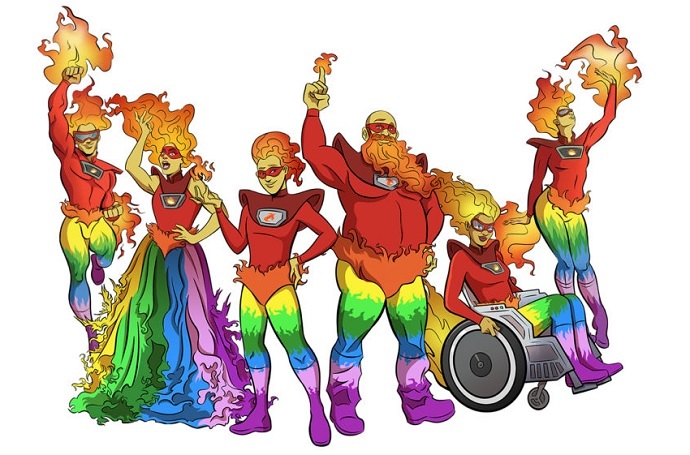 Being a little sappy is powerful because it’s all about expressing good feelings and passing them onto others, which is kind of radical in some ways — and also exactly what Flame Con is all about. It was what my soul needed. I got to spend a weekend in safe and comfortable company. I got to meet up with friends from all over who I’d never gotten to spend time with in person before. I got to cosplay for two days as my favorite character, Pidge Gunderson from Voltron, and I got to enjoy the comforting feeling of slipping into a costume and feeling my insecurities melt away. And most of all, I got the honor of being a part of that event for every other person like me whose soul needed the same thing. Kat Overland: Flame Con is definitely one of my favorite conventions — this was my third year attending and my first year on panel (thanks CP! ), and I had a great time. I agree with Paige on there being a kind of intimacy to the con: Flame Con feels like a homey hub of friends, and if you don’t know anyone going in, there’s a bunch of opportunities to meet them while there. And you’ll probably still join everyone in dancing when the Spice Girls comes on in artists’ alley. And what an artists’ alley it is! It’s a joy to be able to see so much art from so many different kinds of queer creators. Get that many queer creators together and that means so many different kinds of queer stories are being shown and represented — zines on self-care, college romance comics, works by queer pioneers on the webcomics scene, QPOC being written as actual leads — it can be overwhelming! (however, I DO wish there was more art celebrating the body diversity on display throughout the whole convention.) It’s a great way to find new creators to follow, even if it isn’t so great on the budget. Flame Con felt like a recharge, a reminder as to why I sink time into comics in the first place. It’s rad to see mainstream creators from the big publishers at a queer con, even as the struggle for representation in mainstream comics feels Sisyphean sometimes. It’s also real balm to be right in the center of a ton of indie creators who are already doing that work for their own audiences. I feel invigorated with the motivation to keep on with my own creative work, and motivated to make it as queer as possible.